Should you write about popular legal cases? 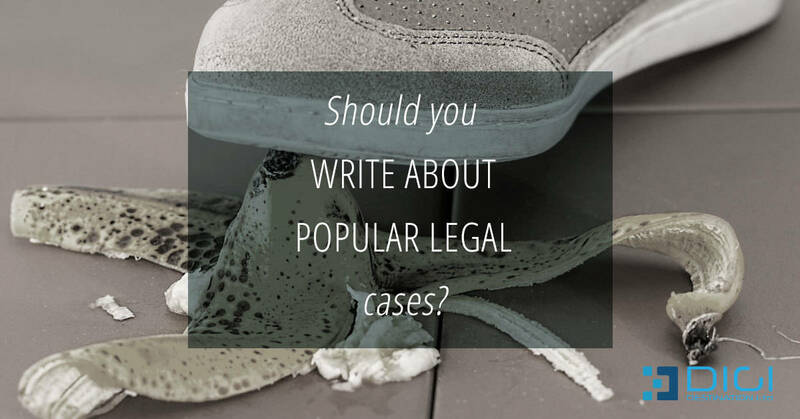 Home » Content » Should you write about popular legal cases? Finding new ideas for attorney blog articles can sometimes be a bit of a challenge as you are trying to establish your legal presence online. While you should come out with your own blog post ideas, some general guidelines apply in regards to successful content. That essentially means you can follow these to post content that is more impactful than the rest. A great way to do this is by posting popular torts (damages) for the promotion of your personal injury services. If this is not your specialty, you can at least post content that is relevant to the area of specialty. Content that is relevant and relatable to your readers is a grand factor for successful content strategies. This is due to the fact that people seek and read content that they can relate to and answers their basic questions regarding the specific service being offered. Now, since the current article is for pop torts content, here is how you can post about it. First you need to choose a particular and famous tort sub-category and then mention a case study or multiple case studies in brief. To make the content more relatable to your readers, you could start with a hypothetical question like:”How you can claim your rights when your experience a third party injury?” or something similar and specific. You could also engage in a bit of storytelling and mention briefly the facts in easy to understand terms (not filled with excessive legal jargon). And it’s well-known fact that most people love to read stories they can relate to so this isn’t a waste of your time. For an instance,let’s say that your firm handles personal injury cases. A very famous case to mention would be “The Hot Coffee Lawsuit” between the world famous giant Mcdonald’s and Liebeck. By analysing some legal aspects of a case, your readers will gain a better understanding on current legislations, their rights to appeal, and of course, how you can help them as an attorney/legal firm.